Music and time are inherently linked. Specifically music and the passage of time as it gets entangled with memories, emotions and events in your life. Music is a vehicle to be used to travel through your life, whether or not you want to. It causes involuntary memory. For some it can be a scary, painful thing, and for others it is a nostalgic and exciting idea to sit in the passenger seat as music takes the wheel. 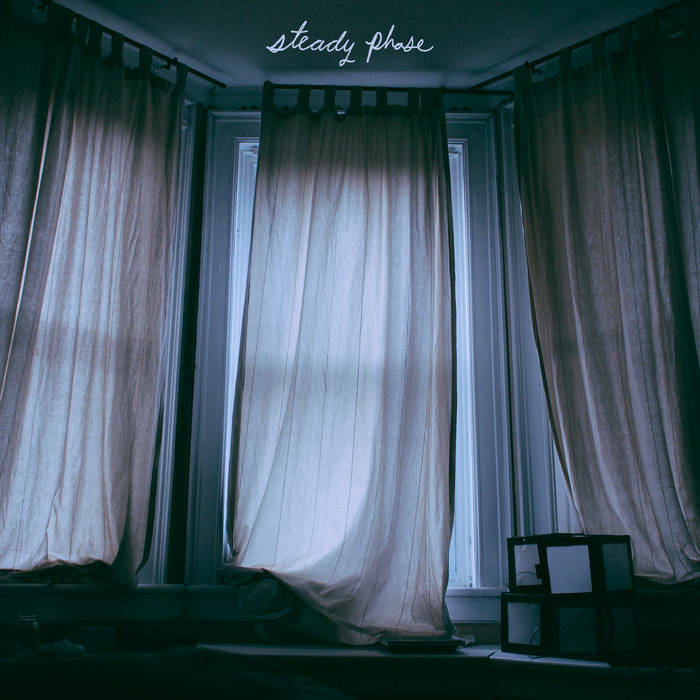 steady phase, an EP from Victoria’s steady phase (a new project from Germany Germany’s Drew Harris), explores this concept perfectly. The title of the EP itself frames the release as an exploration of the phases of life and relationships we move throughout. Each track is, in its own way, a perspective on one of these phases. “track one/ present” opens up the EP with thumping drums, a hopeful, optimistic guitar riff, and contented synth lines. About halfway through, the drums on the track begin to syncopate and bounce around, creating an almost whimsy. It generates an exciting feeling of being at the start of something, the “present”, and knowing that the only direction you want to move in is forward. In “track two/ trust” steady phase sends us into a steadier pulse-like rhythm of 808’s. During the B section of the track, vast, reverb heavy guitar and synth leads in combination with the constant drums puts us at the moment the excitement of life settles down and we fall into a routine, beginning to build a comfortable trust. It all comes together to form a track that is predictable yet comforting, as though you’ve heard it before. steady phase skips right to a bittersweet and peaceful sounding “fade” for the last track, intentionally missing the messiness that transpires as change occurs and we move on. Harris leans heavily on the drums and synth in this track, leaving out guitar, creating a resonant, wistful sound. A pensive synth loop closes the EP, almost as if it is reminiscing and reflecting on the release as a whole. Leaving out the pain and end of a life-phase points to an optimistic and perhaps lacking perspective on things; who wouldn’t want to go past the height of comfort and trust with all- yourself included- in life, and immediately into a fading and forgetting of the phase? Pain would be left out, but so would a crucial feeling that life has to offer. Part of the brilliance is that these three tracks, all displaying the rise and fall of a life event, can be applied to any infinite number of them that we experience. Although the three tracks are quite similar upon first listen, the shifts in between each one are worth putting the effort into picking up on. The subtle feeling of empathy created lets us step into steady phase’s shoes, or anyone’s, for that matter.